Was most impressed with how quickly the cables arrived, and after researching prices for the cable at Retail outlets, your price enabled me to buy an extra one and give as a gift to my daughter for use with her TV. Thanks again. Bluetooth 4.1 and Dual 5W 52mm Drivers, and a unique Triple-Magnet construction - for when only the best will do! 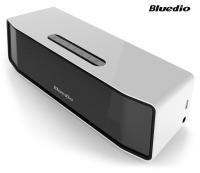 Get the best with the Bluedio BS-3 Bluetooth 4.1 Speaker. Using an innovative Triple-Magnet Speaker Driver design, you'll experience sharper sound reproduction via the powerful dual 52mm 5W drivers. Conectivity options include a 3.5mm AUX input (cable included), and a built-in microphone for function as a Bluetooth hands-free kit. Big, powerful, without being big and cumbersome. The perfect balance of audio engineering in a small Bluetooth package, so you can take your tunes on the go. At the heart of this speaker is a strong performing dual 5W 52mm drivers for excellent audio reproduction of music, gaming and movies. The built-in rechargeable Li-ion battery is good for up to 5 hours of audio playback and talk time (yes, it works as a hands-free kit!) and we found it exceptional for sharing films on a small screen when regular speakers are too weak. Includes a charging cable, 3.5mm stereo audio cable, Micro-USB charge cable and user manual. Answer: "Yes, this speaker will work on any computer. Simply connect it via the headphone port on the laptop with a 3.5mm male to male stereo audio cable (eg:http://www.cablechick.com.au/cables/15m-stereo-35mm-mini-jack-cable-male-to-male.html). Computers, laptops and tablets with Bluetooth may also connect in wireless mode." Answer: "That will depend on your phone and its operating system. Many phones will only output sound to one device at a time, so check your user manual for more information on its Bluetooth features and functions." Answer: "The BS-3 is a newer, larger unit compared to the BS-2. The BS-3 model offers 2x 5W 52mm drivers, as apposed to 2x 3W 40mm drivers on the BS-2 model. Also the BS-3 features more advanced audio processing at 24bit/48KHz as well as Triple-Magnet powered drivers for improved sound reproduction." I recently received a male to male cable which is difficult to find and was very happy with the service from Cable Chick. The item came very quickly in the post and I was most impressed by your friendly customer service.